Whether it’s your genetic makeup or the number of siblings you have, some things in life are out of your control. Fortunately, your ability to protect your assets doesn’t have to be one of them. For over 30 years, Rick Tinker Insurance has been dedicated to helping our customers throughout Texas obtain the right homeowners’ insurance, auto insurance, and windstorm insurance coverage for all of life’s unknowns. We specialize in helping you prepare for the unexpected. From windstorm insurance to medical coverage from Blue Cross Blue Shield to superior auto protection, we have all of your major insurance needs covered. Our agency is committed to providing our clients with quality policies at competitive rates for condo insurance pearland, along with exceptional customer service that is worth every penny. Learn more about the various types of coverage that are available here. Do you live in a high-risk area for weather-related damage in Texas? Special coverage that includes severe weather insurance, windstorm insurance and flood insurance may be the right choice for you. Residents who live along the Gulf Coast face particular dangers from fierce windstorms, damaging hail, torrential rain and other harsh weather conditions. Don’t wait disaster strikes to protect your valuable belongings; get a quote from one of our experienced agents today! Announcing a new alternative to the T.W.I.A. 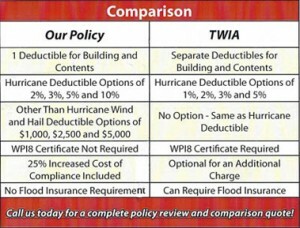 policy with competitive rates and more options that could save you thousands of dollars in the event of a claim. Does your current auto insurance feature the most competitive rates available in Texas? Are you sure you’re getting all of the discounts you quality for and the customer service you deserve? At Rick Tinker Insurance, we’ll review your policy and do everything we can to maximize your savings for Houston Auto Insurance. We’ll also take the time to explain the details of your policy to you and answer any questions you have, so that you understand exactly what you’re getting for your money. Visit http://www.farmersagent.com/rtinker for more information. For more information about what Rick Tinker Insurance can do for you, click on the “Our Company” and “Services” portions of our website, or fill out our contact form today!